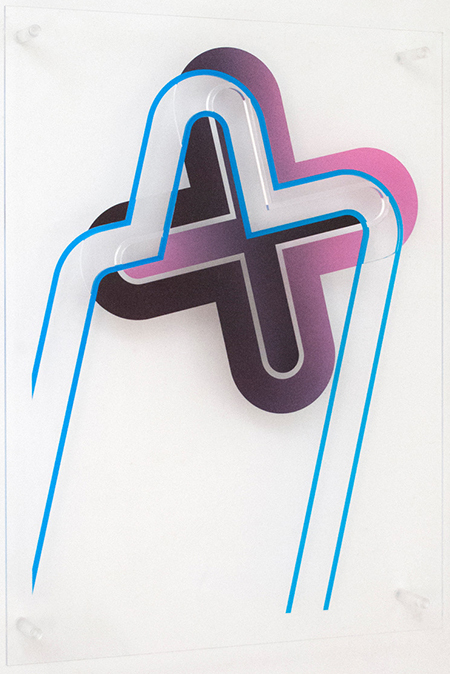 Loring Taoka, "(untitled - overlapping biarcs with removed parts)," 2018, acrylic on Plexiglas, 24 x 18"
Loring Taoka has taken his acrylic paintings on Plexiglas in exciting new directions by pinning them to a support rather than leaning them against the wall on a pedestal. There is a gap of several inches between the image and the wall that making it feel like they are floating in space. The other major change is the actual removal of glass from the surface, forming cutout sections that interact with the colorful geometric permutations that produce the imagery. Taoka’s hard edge graphic abstractions look like the fruits of linear algebra crossed with integral calculus, but with bold color variations. The forms and lines are experiments in how he seeks to influence the perceptual apparatus in the viewer in a particular space and within a certain duration of time. In “(Untitled- X with removed parts)” a tilted clover ‘X’ shape in purple gradations seems to either originate, or bear the brunt of, blue vector lines that shoot into the picture plane. Conversely, the lines of force might be reaching beyond the realm of the image. In “(Untitled-rounded annular sectors with removed parts)” there are crescent shapes with an unbroken overlay of vector lines that almost close the circle. Here, Taoka’s work most closely resembles the non-objective output of Kazuya Sakai, the Japanese/Latin American master who pioneered geometric abstraction in the 70’s. Decades later, through his art, Taoka argues against postmodernism, that even though perceptual modes vary and experience constantly alters the visual point of view, an identifiable self defines what it means to be human.